Kat asks how are you starting? Well this is a great start isn't it?? Like the Mad Hatter I'm late, I'm late! 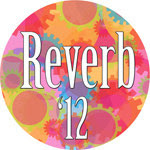 Pop over and catch up with other Reverb '12 bloggers HERE. Hope everyone enjoys Reverb '12 .